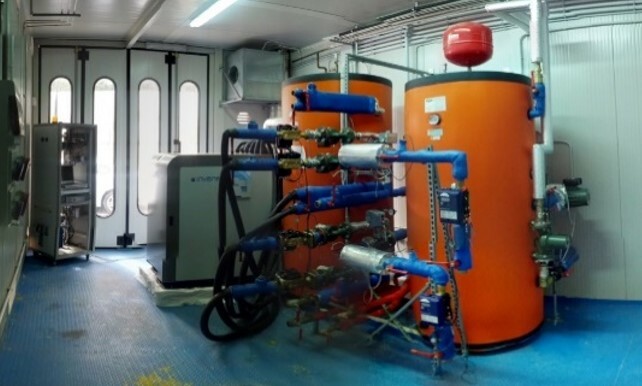 The testing rig for thermal and hybrid chillers/heat pump is located in CENTROPROVE and was designed to supply the power and temperature levels needed for the operation of thermally-operated systems. The main components in the testing rig are the hot storage tank, with a volume of 1.5 m3 (1) and the cold storage tank, with a volume of 1 m3 (2). A gas heater (3) and an electric heater (4) provide hot water to the hot storage tank, while a vapour compression chiller (5) cools down the water inside the cold storage tank. 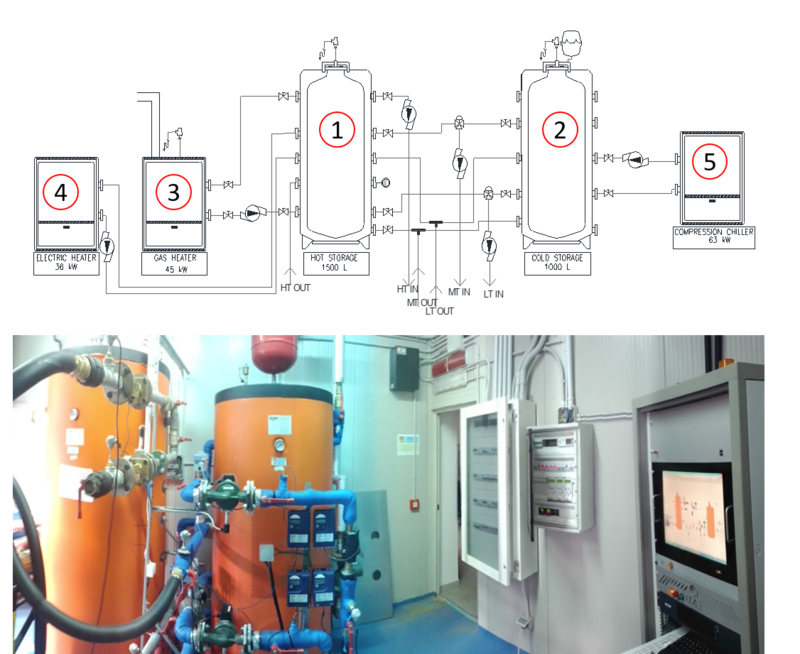 Water in the HT circuit of the system is taken directly from the hot water tank, while the temperature levels for the MT and LT circuits are obtained by mixing the water in the two storages through motorised mixing valves controlled with a PID algorithm. Heat transfer fluid in all the circuits is water. All the pipes are thermally insulated and equipped with variable speed pumps. Data from transducers are monitored and recorded using NI hardware and LabVIEW® environment. Electricity meter with class 1 tolerances to measure the electricity consumption of the components (compressor, controllers, pumps, valve motors) in the system.